Qmaster Senior (in the picture above) is a variable RPM-Fan, PID controller that has 4 programmable Pit Temperature stages. When your food reaches the set temperature that temperature is maintained for the time you set. An additional overall maximum temperature guards this process. That way you can have your meat undergo the exact “treatment” you think will work out best and have your hands free for other things you need to do (like work..?). Do I have to use all these stages? No, not at all. Most people set their desired pit- and meat temperatures and off they go. 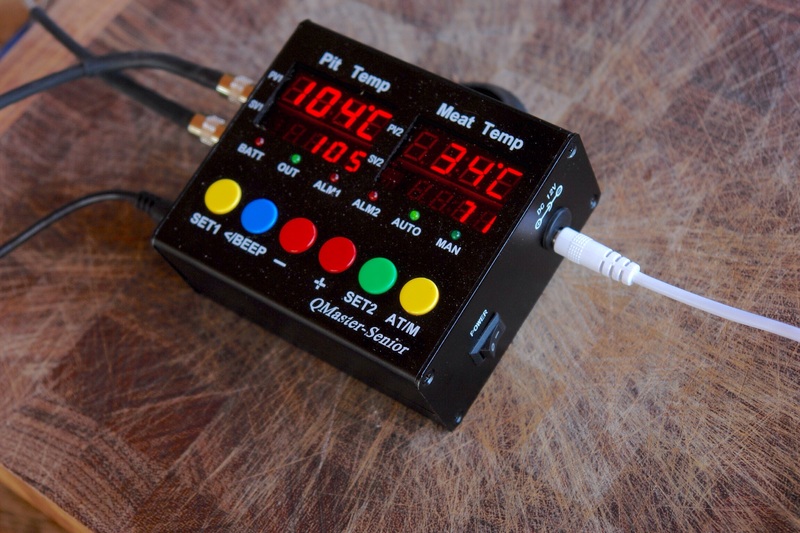 If you don’t set a temperature for a second stage, Qmaster Senior will disregard all further settings and hold the pit temperature until your meat reaches the desired temperature, just that simple. So what is this PID controller? PID controllers are used throughout electronics to achieve precise values where they are required. For example in the oven you use in the kitchen. They are also used in swimming pools where the water is kept at a certain temperature or in quadcopters for flight stability. In this case the controller senses the pit temperature and compares it to the desired (user-set) temperature. It then calculates the difference between the two (P, proportional), looks at the rate the actual temperature is going towards the desired temperature (D, differential) and how long it is trying to correct the difference (I, integration). The combination of these figures determine the RPM of the fan. Simply put, when there is a big difference between set and actual temperature the fan will blow at high speed and when approaching desired temperature it will slow down and eventually stop. Do I need to worry about that? No, all of this math is done automatically and you don’t have to adjust anything for it to work. However, if you think you should tweak your Qmaster Senior to perfection for your type of cooker, you can. The PID values that are pre-programmed are user adjustable for fine-tuning. Isn’t it difficult to program or use? No, not at all. As mentioned before, you can use it in a simple way too, by only setting desired Pit Temp and desired Meat Temp (for a specified time if you like). That way it works more like the systems competitors offer. At a far lower price…. Qmaster Senior is sold as a set. What’s in a set depends on the type of cooker you use. You can choose an adapter specifically designed for your type of cooker or a universal one that allows you to decide where to put it on your cooker by making a 20mm hole in the side of your cooker or the Firebox of your offset-smoker, and fitting the adapter in place and tightening the supplied nuts. Alternatively, you can use the 20mm thread to connect the fan adapter to your smoker’s or cooker’s piping. If you need a 90° connector, that is available from the shop as well. Please check our media page to see this little marvel in action.